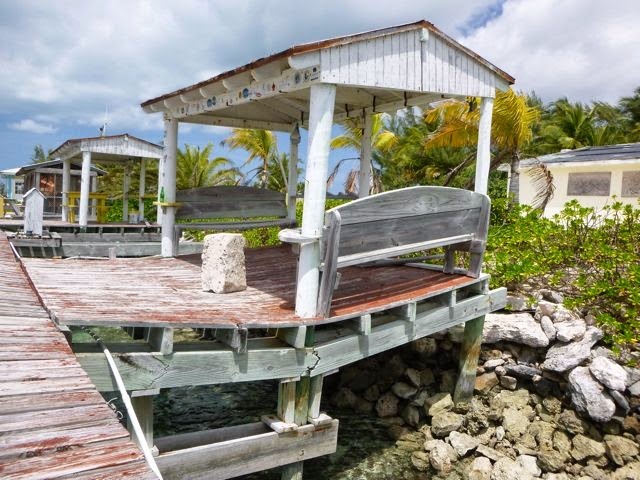 "Embark on a journey where adventure is the norm rather than a once-in-a-lifetime experience.... Immerse yourself... in... a full service marina, dive facility with beachfront villas and a restaurant/bar." -- Sumner Point Marina ad, 5th Edition Far Bahamas Explorer Chartbook. Rum Cay's Sumner Point Marina. Current chart books are important (see Ed's Dead for another note on that)! A few hurricanes can transform a five star marina to, well, something quite different. And yet, different isn't necessarily bad. Rum Cay's Sumner Point Marina (click here for their Facebook page) is a case in point. Yes, that support is indeed that cracked. We anchored off Rum Cay's the Southern point, at Port Nelson, figuring it offered good protection from the Northerlies. It was still pretty rolly. Wayne radioed ahead to ask if anyone could give us an access status for Sumner Point Marina. 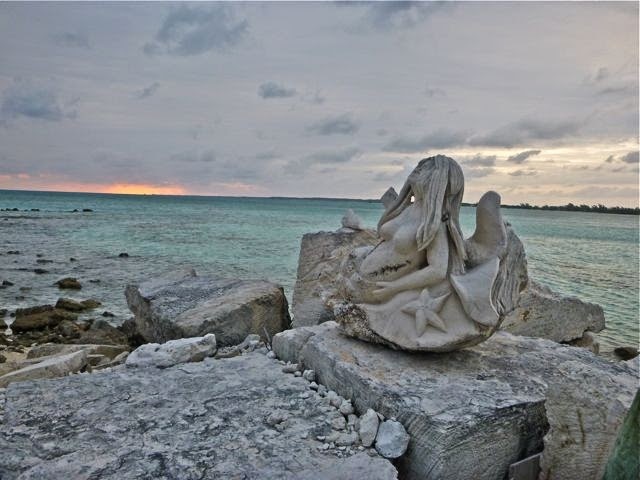 Thanks Moonraker, to another cruiser's Sailblogs Rum Cay post, we read that the marina was closed and decrepit, but offered good protection and was free. The boat we reached in the marina was not very encouraging and we knew from our charts the entry was treacherous -- shallow with a reef on each side and lots of coral heads and rocks. 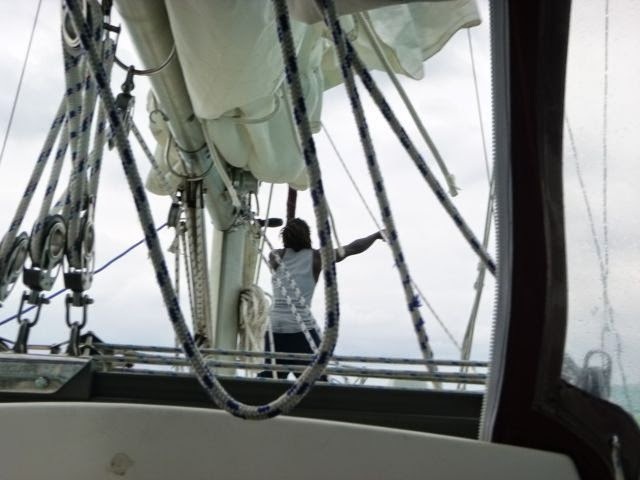 In fact, we pointedly arrived at Rum Cay near high tide to up our odds of entering the marina, if desired. Wayne dinghied over to check out the marina after we anchored, and decided it was too challenging. 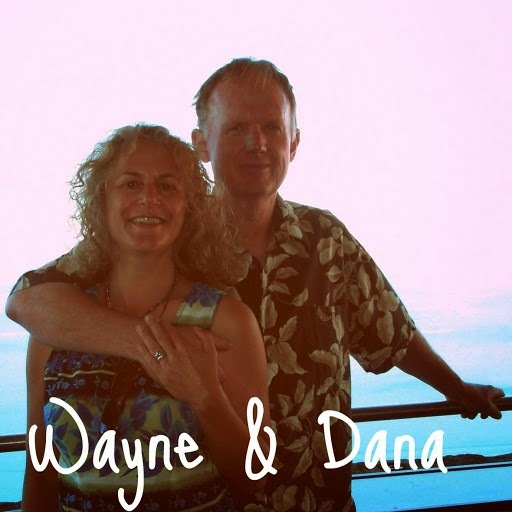 As a respite from the shake-rattle-and-roll, Wayne suggested we take a walk shoreside. Considering the chop, it took some urging. 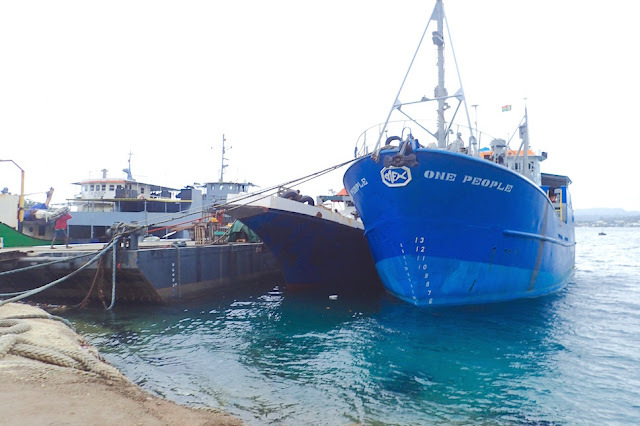 We beached next to the laderless government dock. 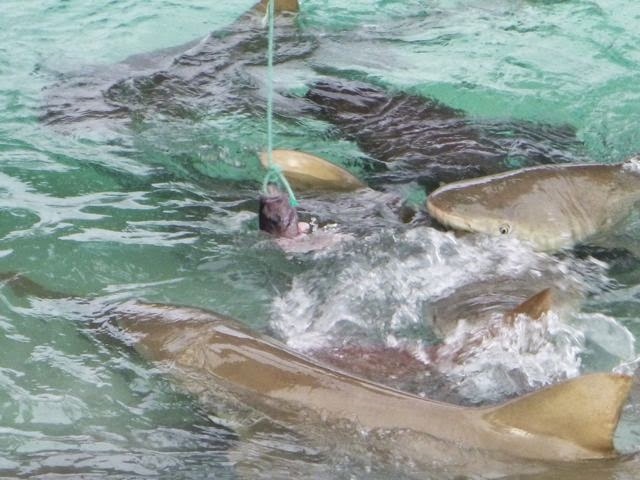 Snapper heads were popular with the local nurse and lemon sharks. Within minutes, we bumped into The Three Muskateers -- locals Marco, his cousin James, and Dave, another cruiser, who tied off in the marina (watch for more on this trio in future posts). Marco assured us there was indeed room and offered to get on our boat and guide us in. We all first walked back to the marina together; discussed our draft (4 1/2') and Marco showed us where we could tie off, next to Dave. 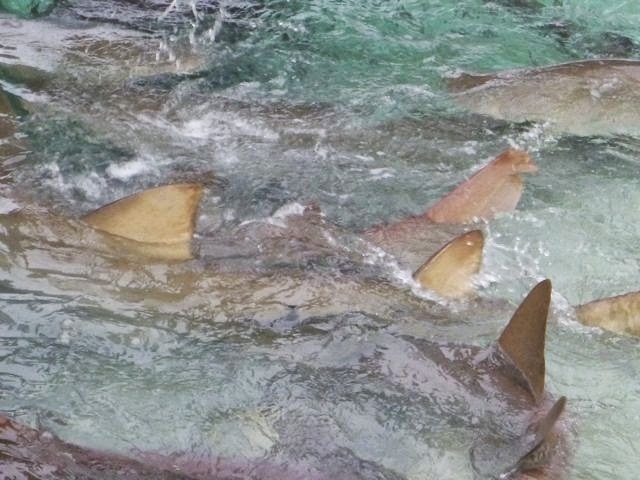 there's a shark feeding frenzy. We returned back to our boat, soaked, carrying the three of us in the chop, and Marco, true to his word, guided us exactly onto the pink line course to the marina indicated our Navionics chartplotter and in safely. We were a few hours off high tide, and the lowest point Wayne tracked in was 7'. We had plenty of help tying off, including Dave from his dinghy. Uhhh, no swimming for me in the marina! We confirmed that once upon a time the marina was indeed a spendy, 5-star resort, with an excellent restaurant. Still, it's a bit like visiting Venice, glorious even in its decay. Unlike Venice, what Sumner Point Marina lacks in Venisian culture, it more than makes up for with crystal clear water, rich with vibrant sealife, colorful land characters, and no odiferous scent (when I went to Venice, discovered it is a stinky place). Like Venice, there's even some pretty cool sculpture. 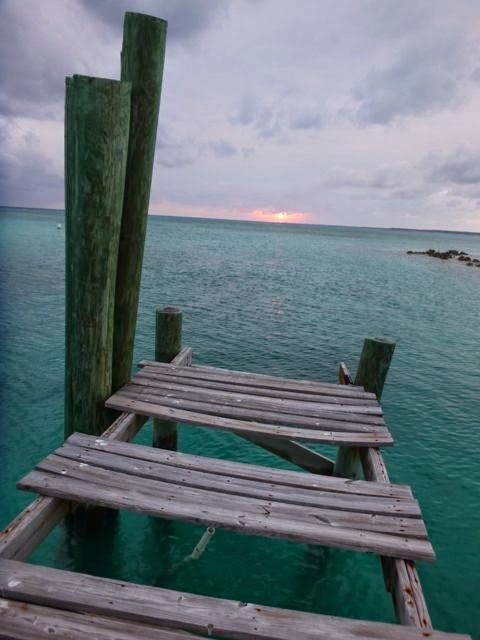 If you're okay with wavy dock deck with missing planks and the need to keep your tracks in the middle of the walkway lest the rotting nails give way... no water, no fuel, no bathrooms, no laundry, restaurants a bit of a walk away (Ocean View gets rave reviews -- can't say firsthand as we rarely eat out so the distance is a moot point for us) -- free is a very good price. Bill, Rum Cay Sumner Point Marina's owner. Friendly people, beautiful spot, and free works for us! 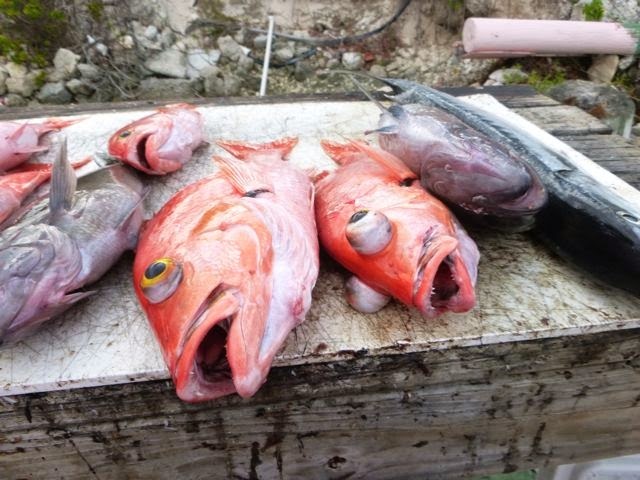 April 12, 2014, BAHAMAS. 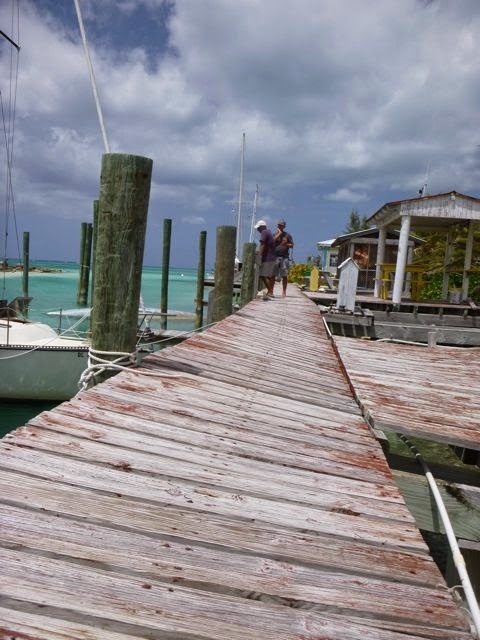 We're Sumner Point Marina on Rum Cay (N23.38 W74.50); most likely we will set sail for Conception tomorrow. 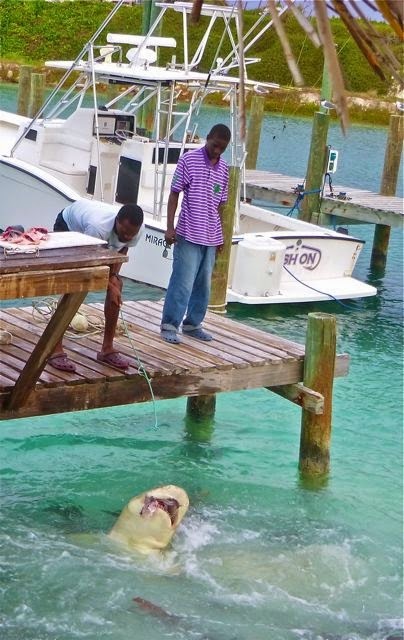 Unless Rum Cay marina's changed in the last few months it's a place to crash not a "normal" marina or resort. Sure didn't look like there was anytjhing afoot when we were there to make that happen anytime soon!